Are long hours at a computer causing grief? Ever experience neck pain, headaches, shoulder or back pain with your inactive office job? A study done by B. Cagnie et al. showed that 45.5% of office workers in 12-month had a prevalence of neck pain. Interestingly, it also revealed that women had almost two-fold risk compared to men. Why do I have pain or tightness? How do I become pain free? Well, have you heard of the SAID principle? It stands for Specific Adaptation to Imposed Demands. Certain muscles have weakened in relation to the continuous postures you’ve put yourself forcing other muscles groups to tighten (SAID principle). Basically, your body will ultimately adapt to the positions you put them in for the longest duration eg. 40 hours of sitting at a desk. However, this is unfortunately counterproductive to the things we do outside of the office such as running, training at the gym or weekend soccer with the family. So, lets go straight to the source, and strengthen the weakened muscles so muscles around them don’t compensate and tighten. Will stretching the muscle alone help? No, stretching alone would be a temporary fix as we are not addressing the problem of why these muscles are feeling tight. 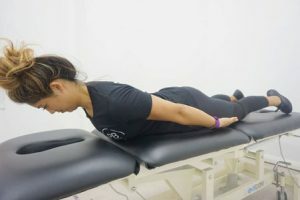 For long term result, you will need to lengthen the muscle first followed by strengthening the muscle group causing it. Below are exercises that can help you with these issues. Exercise improves discomfort for office workers. Each exercise includes 10 repetitions and 3 sets (with a rest of 60 seconds) on alternate days. Information provided should not be considered as medical recommendations or advice. Please consult your health professional before doing an exercise program. This strengthens your deep neck flexor muscles and aids with neck pain, stiffness and, neck related headaches. Your deep neck flexor muscles are responsible for stabilising your head on your neck, and reducing that poked neck posture causing you discomfort. This in turn prevents levator scapulae and upper traps from feeling tight and having to work overtime to stabilise your neck. 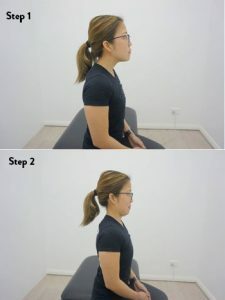 A regular exercise program performed for four weeks can decrease neck and shoulder pain and improve neck function and quality of life for office workers who have neck or shoulder pain. Perform this exercise for 10 repetitions with a 1-minute break. Repeat this for 3 sets and perform this exercise daily. Have your back against the wall and arms outstretched by your trunk. Keep the back of your wrist and lower back in contact with the wall throughout this exercise. Get up and move around every hour! Starting an exercise program in the gym will also help with inactivity, cardiovascular fitness and global strengthening. If this does not resolve the issue, please consult a physiotherapist. Pei Gan is the Managing Director and Owner PB Physio. 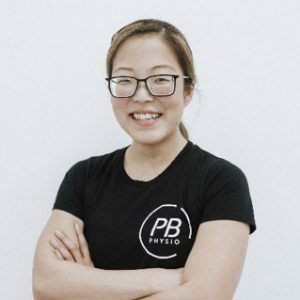 Gan is a Physiotherapist (BAppSci) who specialises in musculoskeletal physiotherapy, specifically sports and performance for strength athletes (powerlifting, weightlifting, bodybuilding and gym goers).